Looking for images of spotted wing drosophila? 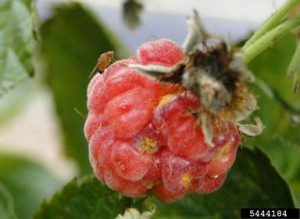 Female spotted wing drosophila on a raspberry. Photo: Hannah Burrack via Bugwood Insect Image Database. We often get requests for images of spotted wing drosophila from extension agents and others. The Bugwood Insect Images Database has a large selection of images of SWD adults and damage associated with larvae, including many photographs contributed by members of our project team.